Model-T Series Gun SafeOl’ Henry Ford would be proud of this safe; his time–honored philosophy of simplicity and functionality finds its home here. 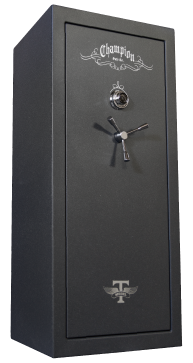 This North American-made safe comes in one size and one color––a class, textured granite finish. The Model T provides high security and excellent quality at Champion’s most economical pricing– a safe all can afford to own.